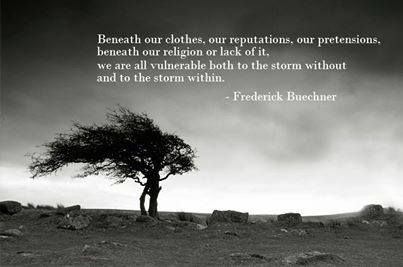 I remember when my brother first introduced me to Frederick Buechner. He shared this quote with me, and I was hooked. And thankful. Good stuff. And it gave me freedom to believe that I might possibly be on the right track in my life. That’s really good stuff. Since then I’ve been paying more attention to Mr. Buechner and his thoughts. That one calls for intentionality and focus in the choices we make every moment of every day. Hard to do, but we have to try for the Light to shine through the darkness and for Love to win. Then today there was this. This moved me to tears. We are all more alike than different. It’s true, isn’t it? We all face storms, and we need to give each other grace in that. Underneath it all, we are the same. Tonight I am thankful for Mr. Buechner and his thought-provoking messages. When I am facing storms it seems like people–family, friends, sister friends, even people I happen to meet for a moment–just come out of the woodwork to help me through it. With laughter, with love, with presence. If I will let them. And that’s it. Some people aren’t lucky like that–to have people who care enough to walk alongside, holding an umbrella. And some people hold it all inside and don’t let others know about the storms. And so they face it alone. Lisa D’s a big Buechner fan. I still haven’t read him. Guess I’ve got something to look forward to, huh?